Lear/Carson Collection. The collection consists of Linda Lear's archive of materials used for her biography, Rachel Carson: Witness for Nature, and for the anthology, Lost Woods: The Discovered Writing of Rachel Carson , as well as personal papers given to Lear by Carson's colleagues and friends. Open to Students and Scholars. Contact: Benjamin Panciera, Director of Special Collections & Archives 860-439-2654. The Rachel Carson Papers, given by the estate of Rachel Carson in 1965, are included in The Yale Collection of American Literature, Beinecke Rare Book and Manuscript Library, Yale University, PO Box 208240, New Haven CT 06520, 203-432-2962. The custodian of the Dorothy Freeman Collection, letters of Rachel Carson and Dorothy Freeman. Special Collections, Ladd Library, Bates College, Lewiston ME 04240, 207-786-6272. A collection of manuscripts related to Carson's graduate studies in zoology at the university during the early 1930's. Archivist James Stimpert, Archivist, Milton S. Eisenhower Library, Johns Hopkins University, 3400 North Charles Street, Baltimore MD 21218, 410-516-8323. Photographs: The Estate of Rachel Carson has put most non-copyrighted photographs in the public domain. All the research institutions listed above, plus several of the named organizations listed below, hold some photographs. Format, cost, and availability depend on the institution, as well as courtesy permission. Captions and name of photographer, if known, should be verified from the lending institution. Commercial photographs are available from Magnum Photo, 212-929-6000, and Corbis Images at 800-260-0444. The Martin Luther King Library Photograph Department in Washington, DC has press photographs as do AP Wire Service, World Wide Photo, and Time/Life. See Books for listing of books by and about Rachel Carson. See Organizations for listing of organizations related to the legacy of Rachel Carson. This section is currently under review. Please use the two links to perform simple searches against Worldcat.org and Google Scholar. Those are the closing words of Rachel Carson’s groundbreaking 1962 work, Silent Spring, about the dangers of pesticides. Silent Spring has been credited with launching the modern environmental movement. It might never have made it into bookstores if it weren't for the efforts of a venerable Boston publisher. "The 100 best nonfiction books: No 20 – Silent Spring by Rachel Carson (1962)"
This passionate rejection of pesticides was dismissed by many as the work of an hysterical woman when first published. Now it is seen as a pioneering text in the environmental conservation movement. Although Rachel Carson is best known for her seminal work "Silent Spring," this year marks the 75th anniversary of her remarkable literary debut, "Under the Sea-Wind," published on the eve of World War II in November 1941. The journal for the American Society for Environmental History (ASEH) , and the Forest History Society. The journal of the International Society for the Study of Religion, Nature and Culture. The journal for the Association for the Study of Literature and the Environment (ASLE). Bio is a professional organization focusing primarily on the practical aspects of the art and craft of biography. The Biographer’s Craft is a publication for writers and readers of biography published each month by BIO. It will soon become the official organ of BIO. Rachel Carson National Wildlife Refuge was established in 1966 in cooperation with the State of Maine to protect valuable salt marshes and estuaries for migratory birds. Scattered along 50 miles of coastline in York and Cumberland counties, the refuge consists of ten divisions between Kittery and Cape Elizabeth. It will contain approximately 7,600 acres when land acquisition is complete. Designated a Rachel Carson Component near Beaufort, North Carolina. President Clinton named a section of the Great Barrier Reef during a November, 1996 visit. Passes within 1/4 mile of the Homestead on its 34-mile route from North Park to Harrison Hills Park in Allegheny County. The trail is maintained by the Rachel Carson Trails Conservancy. Maintained by the Boothbay Regional Land Trust, Boothbay Harbor, ME 207-633-4818. A favorite bird-watching spot for Rachel Carson. More than 75 Years of Raptor Conservation. Located in east-central Pennsylvania, Hawk Mountain is the world's first refuge for birds of prey. Open year-round, visitors enjoy scenic vistas, 8-miles of ridge and valley trails, a Visitor Center, Bookstore, and native plant garden, and each autumn, the chance to observe large numbers of hawks, eagles and falcons as they migrate past our lookouts. Operating as a non-profit eco-tourism site, your trail fee or membership dues directly support scientific research, public education and Sanctuary maintenance. Written for Ada Lovelace Day by Jim Stimpert, Sheriden Library, Johns Hopkins University. * Media listed in order by publication. When Silent Spring was published in September 1962 it became an instant bestseller and would go on to spark dramatic changes in the way the government regulated pesticides. Drawn from Carson’s own writings, letters and recent scholarship, the film illuminates both the public and private life of the soft-spoken, shy scientist who launched the modern environmental movement. "Rachel Carson's Silent Spring" produced by Peace River Films for the American Experience in 1993. It is available at some libraries and from PBS. Rachel Carson's Silent Spring: A Book that Changed the World This virtual exhibition presents the global reception and impact of Rachel Carson’s Silent Spring as well as the book’s legacy in popular culture, music, literature, and the arts. 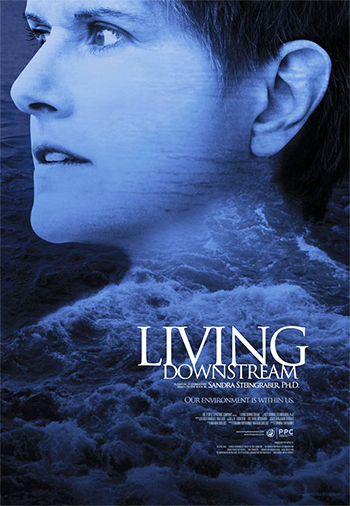 Based on the acclaimed book by ecologist and cancer survivor Sandra Steingraber, PhD., Living Downstream is an eloquent and cinematic documentary film. The Power of One Voice: A 50-Year Perspective on the Life of Rachel Carson is a groundbreaking documentary examining the life of Rachel Carson and the profound implications of her environmental work. 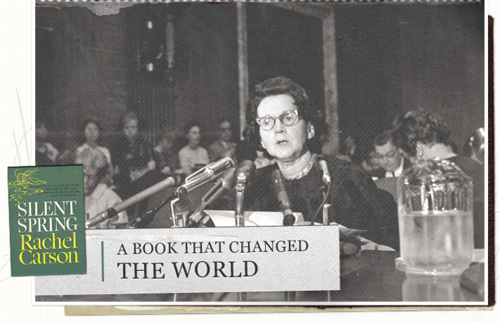 Perfect for classrooms and community events, this 51-minute film features interviews with Rachel Carson’s adopted son, Roger Christie, her biographer, Linda Lear, and other notable writers, scientists and advocates. By highlighting the power of Carson’s voice, we hope to inspire others to add their voices to this essential conversation. More details, including DVD purchase information, at www.powerofonevoicefilm.com .